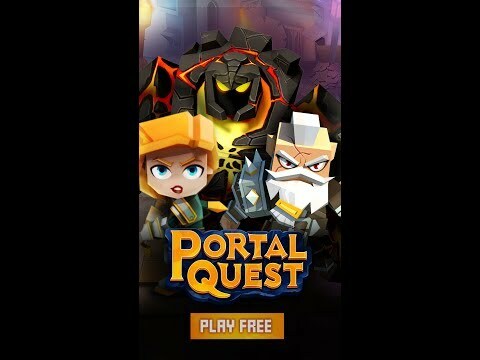 Enter the world of Portal Quest, the next generation of RPG mobile games! Gather and lead your team of battle-ready Heroes to protect against a corrupt force! The Hollow is poised to take over the World as you know it. It’s up to your team to wage through battles to hold the Hollow back. Your enemies will only get tougher so assembling the best team of battle-ready Heroes is essential. Summon your team to take down the enemy while upgrading them to the finest Heroes Portal Quest has seen. It’s the only way we will be able to hold the Hollow back and defeat them for good! • Battle Through the Campaign - Earn gear, experience, and shards to upgrade your heroes by taking down the enemy in 5v5 battles. • Gather the Best Heroes - Collect and upgrade 55+ unique heroes to build out a full team. • Choose Your Heroes Wisely - Each Hero has its strengths. Use them against the right enemies and you’ll end up on top. • Compete in Guild Wars - Join your Guildmates and take on other Guilds in epic battles to defend your Keep! • Tons of Challenging Modes - Whether it’s collecting unique gear from a dungeon or putting your team up against your friends, there is always a battle to wage. * More improvements and bug fixes! • New Heroes: Dragoon and Panther Stalker! • More improvements and bug fixes! • Dragon Heir arrives as a Hero! • Craft Powerful Crystals for your Epic Gear! • Brand New Campaign Chapter and Gear! • Plenty of Improvements and Bug Fixes! • New Hero: Serpent King! • New Hero: Lion Knight! • New Chapter: Ch 15 - Stonecutter! • Dungeon Favor - Boosts Dungeon Rewards!• Guild Attack Point Bank for Guild Wars• New Hero: Twin Trackers• Weekly Quest With Rewards• Tons of Other Player-requested Improvements!